for a couple of years. Since then we've heard lots of requests from site owners for the ability to grant limited permission for others to view a site's data in Webmaster Tools without being able to modify all the settings. Now you can do exactly that with our new User administration feature. On the Home page when you click the "Manage site" drop-down menu you'll see the menu option that was previously titled "Add or remove owners" is now "Add or remove users." Selecting the "Add or remove users" menu item will take you to the new User administration page where you can add or delete up to 100 users and specify each user's access as "Full" or "Restricted." Users added via the User administration page are tied to a specific site. If you become unverified for that site any users that you've added will lose their access to that site in Webmaster Tools. Adding or removing verified site owners is still done on the owner verification page which is linked from the User administration page. Granting a user "Full" permission means that they will be able to view all data and take most actions, such as changing site settings or demoting sitelinks. When a user’s permission is set to "Restricted" they will only have access to view most data, and can take some actions such as using Fetch as Googlebot and configuring message forwarding for their account. 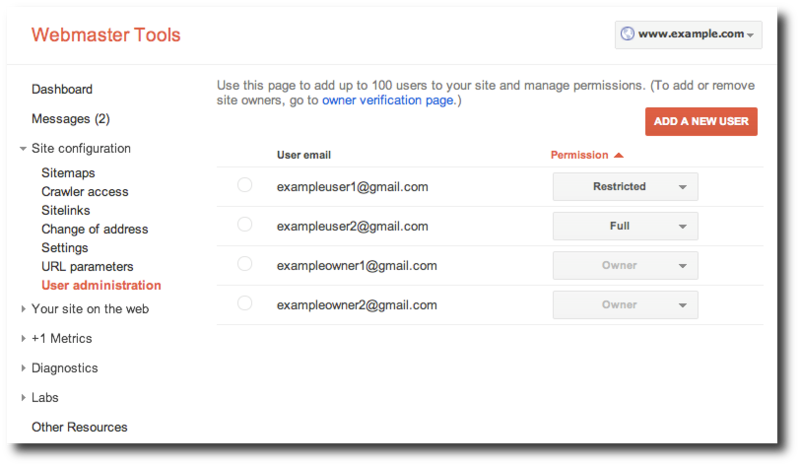 Restricted users will see a “Restricted Access” indicator at various locations within Webmaster Tools. To see which features and actions are accessible for Restricted users, Full users and site owners, visit our Permissions Help Center article. We hope the addition of Full and Restricted users makes management of your site in Webmaster Tools easier since you can now grant access within a more limited scope to help prevent undesirable or unauthorized changes. If you have questions or feedback about the new User administration feature please let us know in our Help Forum. We just launched a new feature that allows you as a verified site owner to grant limited access to your site's data and settings in Webmaster Tools. You've had the ability to grant full verified access to others for a couple of years. Since then we've heard lots of requests from site owners for the ability to grant limited permission for others to view a site's data in Webmaster Tools without being able to modify all the settings. Now you can do exactly that with our new User administration feature.